I knew it! Raging toothache on Friday and every dentist in Nelson is at a conference in Blenheim. Now it’s Saturday and I’m trying to ignore the electric pulses shooting through my jaw. Need something else to occupy my mind and Mapua seems a pretty good idea. Although a mere 25mins from Central Nelson, Mapua has a different weather pattern to the city and has a real cruisey feel. You won’t find art galleries with little bells at the door to herald your arrival – the real stuff here is found in old converted warehouses and sheds. 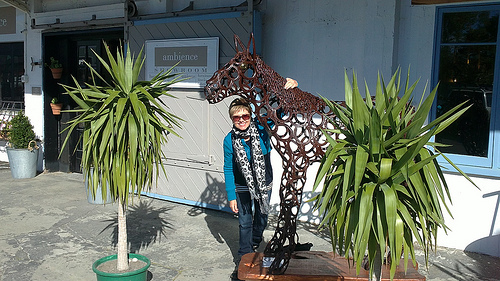 We’ve just past a very interesting furniture maker on the way to Ruby Bay – ok, the furniture interested me more than the maker, but you get my point. 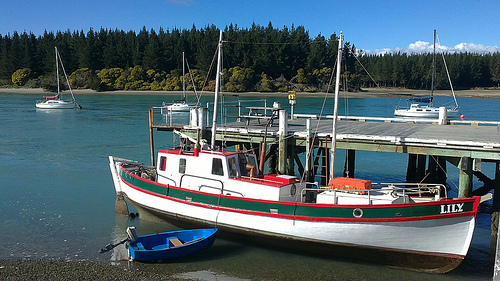 After catching up with one of our favourite honeymoon spots, we head off to the little Mapua township. We need food. Now. Hey, the pain in my jaw has been replaced by hunger pangs. Silent prayer of thanks. 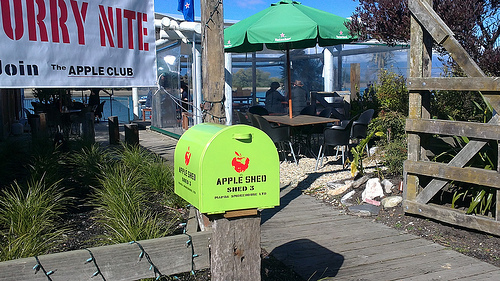 My first choice is the Appleshed restaurant on the wharf, but it’s chocka full of hungry people like myself. Darn. It’s such a neat wee place with fabulous views. 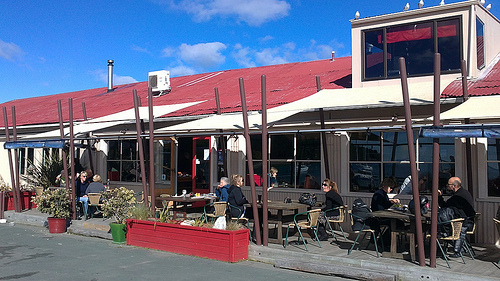 We settle for the Wharfside Restaurant, a more casual pub-like dining experience, but the foods not too bad. Helps that the staff are friendly. Michael asks whether there is actually a menu (don’t know why he always does this) The waiter replies with goodhearted sarcasm, but Michael’s never really connected with Kiwi humour and takes him literally. The cutlery doesn’t arrive until we actually ask for it but I’m glad we’re here – plenty of people-watching to be done and my salmon is delicious. I leave Michael to scour the day’s newspaper from cover to cover (takes him ages) so I’m off exploring the gorg wee places along the wharf. Ok, it’s not exactly a shopping mecca but here’s where you’ll find the unexpected. Functional art, ironwork, old Italian mirrors and beautiful handmade linens – they’re all here. I try to get lost at the back of a converted warehouse, but Michael has this uncanny knack of finding me. I’ve yet to find the homing beacon he’s planted on my person. After lunch, we take a drive around the beautiful rolling hills and valleys of the Mapua area and kinda accidentially enter the Tasman Golf Club at Kina Cliffs. Throwing golfing etiquette to the wind, we speed pass players lining up their shots on either side of the drive. Finally hit the carpark where Michael does a panicked u-turn, almost sending a sweet old pensioner into touch before squealing back down the driveway. I’m sooo embarrassed! “We should have taken a photo of this place” whines Michael. He’s right of course, but a little remorse would have been good. The point is that this lovely little country golf club is opened to everyone and if you’re a keen golfer, you”ll love it – beautiful location. Of course, we’ll never be able to show OUR faces there again. Cold snap in Christchurch and I’m feeling guilty that I’m not there to suffer it along with other Cantabrians – wonder how long that’ll last. Hopefully, like my toothache, it’ll subside over time.